I’m taking my first trip out of Cambodia tomorrow after 5 months living here. 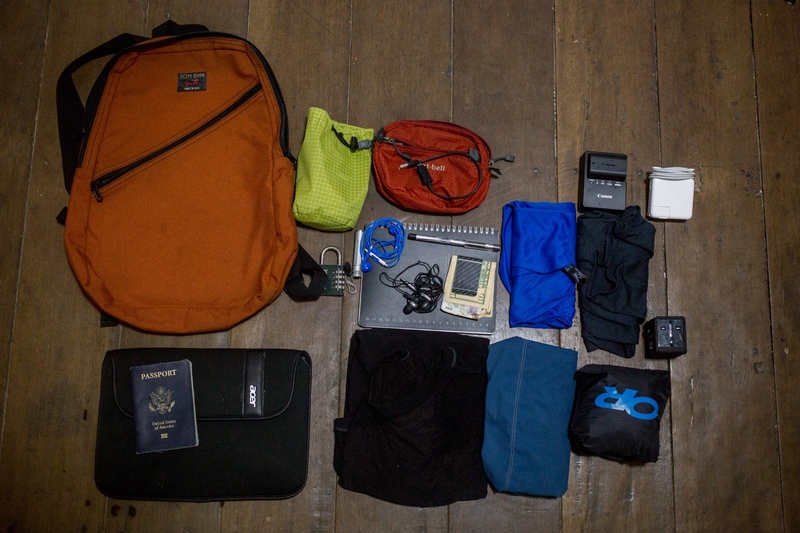 Below is what I’m bringing on a two week trip to Bangkok. All told it weighs 5-7 pounds after you factor that half of the clothes will be worn and not in the pack at any time. It shows an evolution in my packing strategy. I’ve strayed from the Leica to a Canon SLR. I’m packing lighter now since I know what the weather will be like. 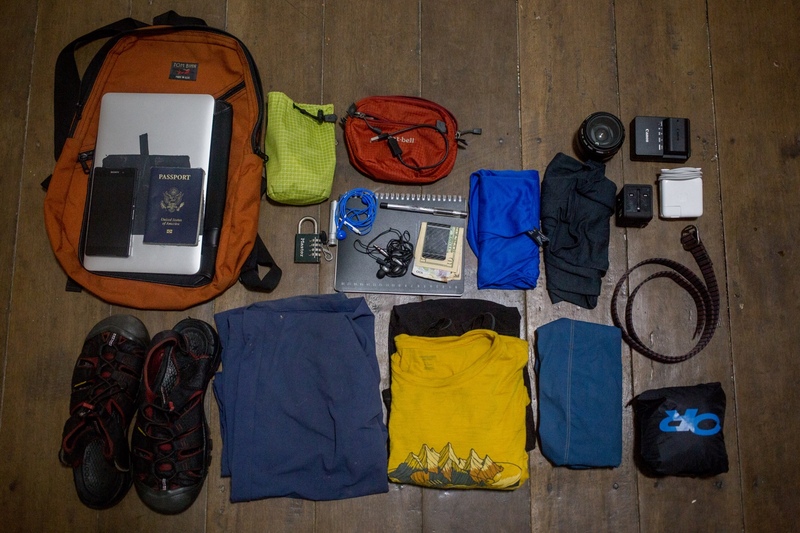 The only things I’m not bringing that I would for a longer trip are my down jacket, external hard drive, tripod, and antibiotics (easy to get in Thailand). Top: Fully loaded. Left: Everything together laid out. Right: What gets carried on my back. I love my black icebreaker v-necks, but it’s way too hot in Asia right now to wear those. So I’m bringing my yellow icebreaker wool shirt and a synthetic t-shirt from Rohan. For the rare chance that it might get a little cold or rain I have an ultralight rain jacket and a wool buff (the buff doubles as a sleeping mask). I expect to wear the rain jacket only in the movie theatre in Bangkok when they pump the air conditioning extra cold. I could bring a down jacket or hoodie on this trip but that’s overkill for Thailand in March. 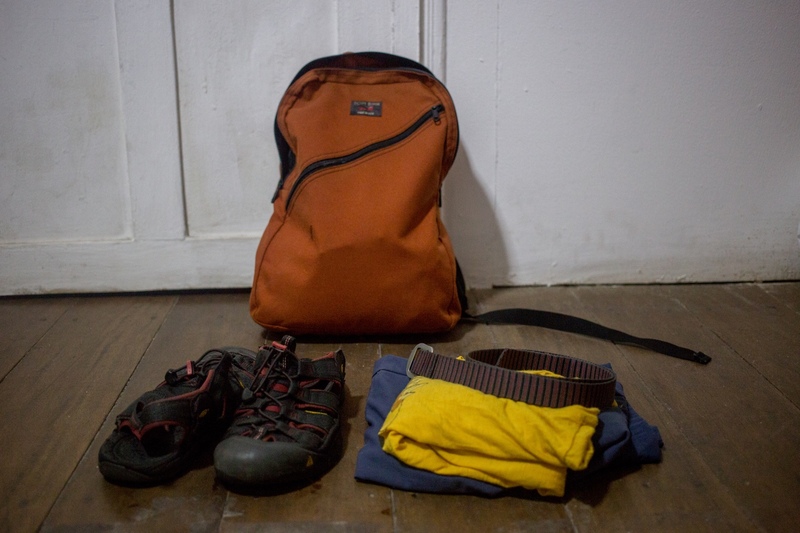 I’ve got a Patagonia ultralight swimsuit (sadly no longer for sale), icebreaker wool shorts for wearing to bed, and Rohan Fusion trousers for wearing most days. I still only have two pairs of icebreaker underwear, no socks, and a belt from Mont Bell that I picked up in Japan for about $10. All of this stuff is heavily tested with the exception of the two Rohan items, which were sent for free for me to try out and send back notes. So far the Rohan gear is working well. The shirt is very practical but I don’t like how it looks. But it’s coming with me because it’s a heck of a lot more comfortable than wool in burning city heat. The Fusions trousers are great looking for a versatile and quick drying pair of travel pants. They feel almost exactly the same as the Strongholds with the exception of being lighter fabric. My favorite thing about Rohan pants — and keep in mind they’ve never paid me other than sending me these free clothes to try — is the clip in the left pocket for keys and the zippered back-right and front-right pockets. I use these zippers and that clip all the time. My clothing needs are very simple and this should cover every environment I encounter. Two shirts so I can alternate days wearing them, one pair of pants, swim trunks, and a pair of shorts to wear at night while I sleep. Notably no socks and only two pairs of underwear. The only shoes I wear these days are Keen Newports. I hate how they look but love how they dry quickly and don’t make my feet sweat. Shoes like these, open ended sandals with some good padding, are wonderful for spending a full day wandering a city. Stepping in puddle isn’t a big deal, taking them off to let your feet breath isn’t an ordeal, and there’s never any need for socks. I took mine into the shower just before taking this picture to wash them, so they’re wet in the photo. Pick an understated color combination and people might not mention how ugly they are when they see you. Mine are crimson and dark grey. Not pictured minor things: usb charging cable, folding tootbrush, fingernail clippers, and this awesome tiny hair trimmer. These days I mostly use a Canon EOS 6D and 28mm f1.8. I get better pictures from it than I ever did from my Leica ME. That’s not to say one camera is superior to the other but instead that my photo skills have gotten to the point where I don’t care much about discretion. On every technical measurement other than size the Canon trounces the Leica. The Canon is quieter, more comfortable to wear, shoots better in low light, has longer battery life, and is water resistant. The Leica has better lenses and is physically smaller. A Leica 28mm f2 lens costs $4,000. The Canon 28mm f1.8 lens costs nine times less. The Canon 6D body costs $1,400 new. The Leica ME body costs $5,000 new. Take your pick: $1,900 camera to trounce through the streets or a $9,000 camera? Oddly the 6D is almost the same weight as a Leica ME and much more comfortable to wear for extended periods. The rubber and plastic case is a lot nicer to have next to my body. I may or may not bring the 40mm f2.8 prime lens that I used to take these pictures. Of course the charger, an extra battery, and an amazing [universal power adapter]() with USB ports. I’m still using the RBH EP2 Headphones rated best by the WireCutter but also pack a pair of counterfeit Apple EarPods for walking in the street (the RBH don’t let in any noise). My phone is a Sony Z2 – very long battery life, water proof, and a 1080p display. It has a phenomenal camera, which I almost never use, and is water resistant. Full review here. My computer is somewhat sadly back to an 11 inch Macbook Air. I wish Apple would come out with a lighter machine with a better screen, but this 11 inch Air is already basically the perfect computer. Apple does input devices better than everyone else. They also have the best setup of third party software. I love Byword, Textmate, and SimpleNote and Lightroom. Those are my standbys and Linux has no good equivalents (I tried, trust me). I tried using an iPad as a computer, but it’s almost impossible to multitask effectively for doing things like taxes and web design. It’s also way too hard to manage large photo libraries. I tried the lightest laptop in the world, which is Tynan’s favorite but found it lacking in durability and hated the keyboard and mouse input. Finally, I spent two weeks traveling with only an LG phone when I went to Siem Reap. That was awesome and I strongly recommend it. But I need to do “real” work now and can’t do that. What’s removed from my more recent packing lists: my long underwear, socks, and previous sandals were given away in Bangkok after months of not being used. I almost never use a tripod, so I’m not bringing it. I rarely wear sunglasses, so those are out too. No water bottle, coffee cup, phone battery, or sleeping sheet. For any of these things I can buy a $1-5 equivalent if I need them. Finally I’m not using a stuff sack for clothes anymore. With this few clothes they do fine in the bottom of my bag or wrapped around my camera as protection. This is an almost ready for anything packing list. It’s versatile, light, and I can carry it all day. In practical terms it costs — without camera, phone, or computer — around $500. You could do much the same with any other gear, or with lesser gear, but I like things that are light, durable, and don’t smell after repeated wearings. My pack as usual is a 16.5 liter Tom Bihn Daylight. I’ve tried a bunch of shoulder bags lately but still love the Daylight more. I stand by my earlier review here.